Imane has been working at Pratt & Whitney Canada (P&WC) since 2010. Her experience has provided skills in engineering for engine assembly preparation and certification, engine testing on the ground and in flight, project management and sustainable development. Starting in 2015, Imane embraces a new role in Controls Systems within the revolutionary turbofan engine family PW800. Academically, Imane graduated in 2010 with a double major in Mechanical and Information Technology from the University of Ottawa. In September 2014, Imane started an Executive Master’s in Business Administration at the University of Sherbrooke Campus of Longueuil. As part of the CASI talk, Imane will be presenting the exciting opportunities she experienced at P&WC in the engineering disciplines and the challenges”young engineer” faces in the professional function of today. The brand new PW800 engine was just certified in February for flight on a new Gulfstream aircraft. Last Friday, Mostafa Fallah presented the results of his MASc research with co-supervisors Dr. Davide Spinello and Dr. Suruz Miah in attendance. Mostafa’s wife also came out to support her husband. Pics below! So UOttawa decided to host a design challenge…here’s what happened. Sebastian’s brother taking it all in. Engineering helping humanity. We hope. Sebastian checks out his new hand. Sebastian (right) and his twin brother (left) take in the proceedings. Makerspace grand guru Dr. Hanan Anis presented a small token of 3D printed thanks to Professor Marc Doumit. PhD student Ruben Fernandez was the second place winner. We’re very proud of you, Ruben! Coordinated missions with platoons of autonomous agents are rapidly becoming popular because of technological advances in computing, networking, miniaturization and combination of electromechanical systems. These multi-agents networks coordinate their actions to perform challenging spatially-distributed tasks such as search, survey, exploration, and mapping. Environmental monitoring and locational optimization are among the main applications of the emerging technology of wireless sensor networks where the optimality refers to the assignment of sub-regions to each agent, in such a way that a suitable coverage metric is maximized. Usually the coverage metric encodes a distribution of risk defined on the area, and a measure of the performance of individual robots with respect to points inside the region of interest. The risk density can be used to quantify spatial distributions of risk in the domain. The solution of the optimal control problem in which the risk measures are not time varying is well known in the literature, with the optimal configuration of the robots given by the centroids of the Voronoi regions forming a centroidal Voronoi tessellation of the area. In other words, when the set of mobile robots converge to the corresponding centroids of the Voronoi tessellation dictated by the coverage metric, the coverage itself is maximized. In this work, we consider a time-varying risk density function evolving according to a diffusion equation with varying boundary conditions that quantify a time-varying risk on the border of the workspace. Boundary conditions model a time varying flux of external threats coming into the area, averaged over the boundary length, so that we do not consider the individual kinematics of incoming threats but rather their averaged, distributed effect. This approach is similar to the one commonly adopted in continuum physics, in which kinematic descriptors are averaged over spatial domain and suitable continuum fields are introduced to describe their evolution. By adopting a first gradient constitutive relation between the flux and the density, we obtain a simple diffusion equation. Asymptotic convergenceand optimality of the non-autonomous system are studied by means of Barbalat’s Lemma and connections with varying boundary conditions are established. Some criteria on time-varying boundary conditions and its evolution are established to guarantee the stabilities of agents’ trajectories. A set of numerical simulations illustrate the theoretical results. 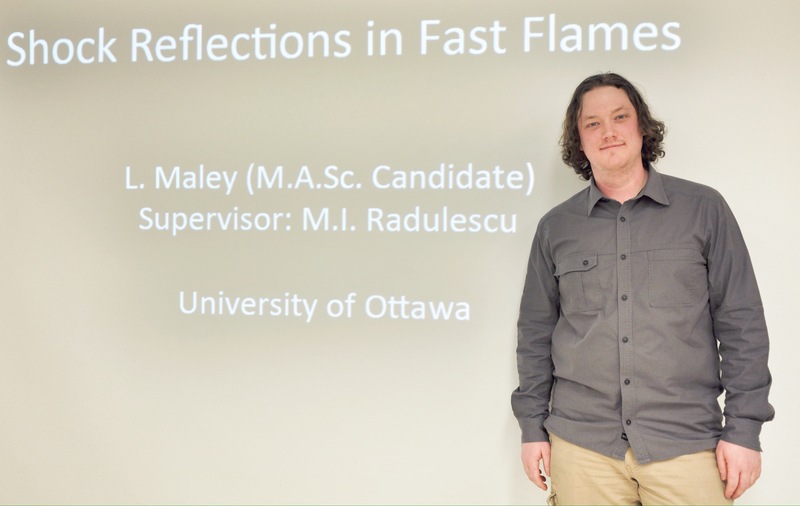 last Friday, Logan Maley gave his MASc Thesis talk title “shock reflections in fast flames”. Supervisor Matei Radulescu was on hand for a very interesting talk. 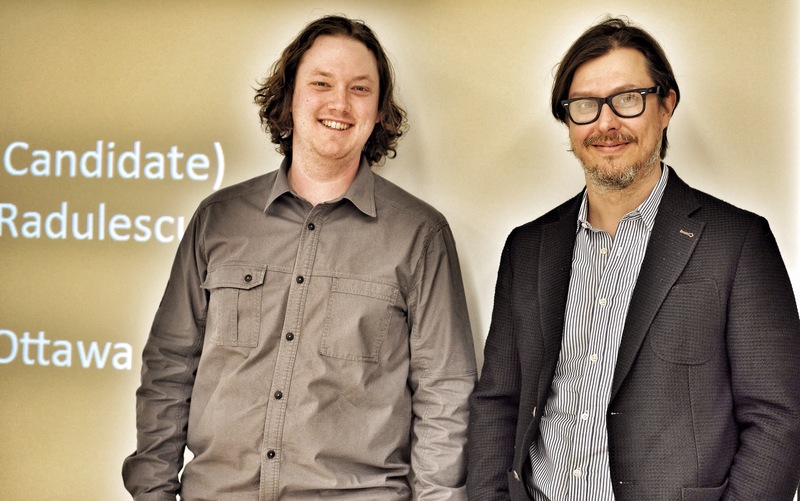 Logan Maley and Dr. Matei Radulescu. So, after a break for reading week, our MCG seminars are back. Fiirst up, we had Arian Panah presenting last Friday. Sadly, supervisor Dr Davide Spinello was AWOL… So I only have photos of our soon-to-be finishing student.